A three tier pyramid-like structure and serves as the underpinning for this temple. 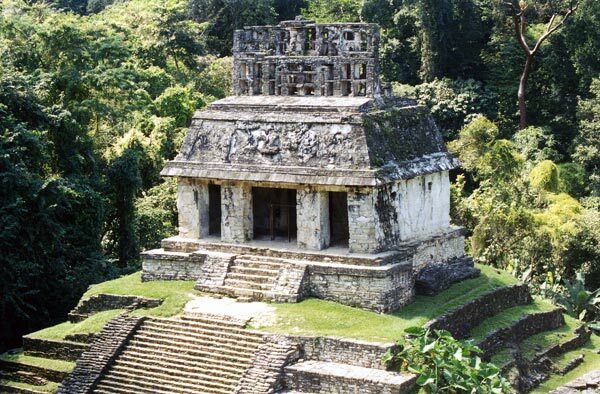 Inside it is a shrine with a sun panel that commemorates the birth of the Lord Serpent Jaguar II (635 A.D.) and his ascension to the throne (684 A.D.). Serpent-Jaguar II is seen on the right-hand of his deceased father the Lord Pacal. Both rulers participate in a ritual act that centers on a sun shield with jaguar like attributes. The central scene, supported by two different aspects of the lord of the underworld, is developed on a band that contains symbols of the earth and the sun god.